This extremely rare passport was issued in Boston and Charlestown, Massachusetts to the USS Jamestown, a United State naval sloop-of-war that was being made available by Congress for use by civilians for a mercy mission. This is the only time such an action was taken by the Congress. The ship was under the command of Robert Bennet Forbes. Forbes was a prominent Boston seafaring merchant who owned or was involved in the construction of approximately seventy vessels. He was active in and made a fortune in the China Trade. Forbes was also a man of courage who, when the Cunard steamship Europa, on which he was a passenger, ran down and sank an immigrant ship, the Charles Bartlett, Forbes leapt into the sea and rescued first a woman and child and then a man. This humanity showed itself in 1847 when the residents of Boston learned that the potato blight had hit Ireland for a second consecutive year and conditions were disastrous. They petitioned Congress for the loan of a ship and the USS Jamestown was made available. Captain Forbes was given command. People from all over the country contributed more than $150,000 in less than three weeks to purchase the relief supplies. This passport is for the humanitarian voyage of the Jamestown. She sailed from Boston on March 28, 1847 and reached Cork, Ireland on April 12th. During the next ten days they unloaded and distributed more than 8,000 barrels of life-saving food and supplies. Forbes was such a hero in Ireland that some children born during his visit were named in his honor. This was the first international relief effort undertaken by the United States. 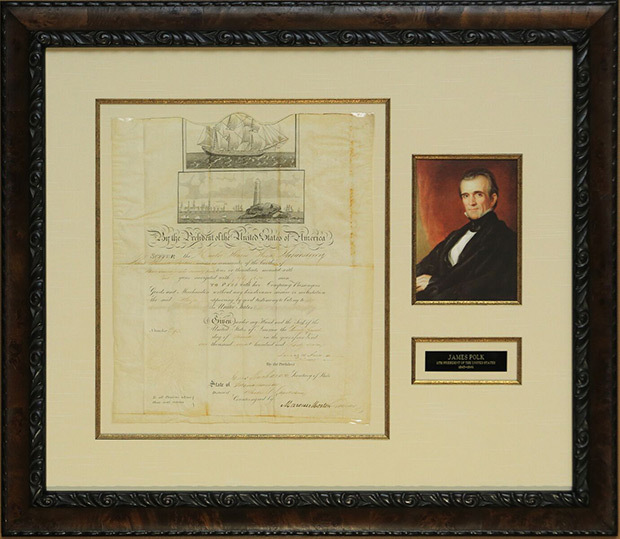 The document was signed by President James Polk who served one term from March 4, 1845 until March 4, 1849. During his term he added vast territory to the United State through war with Mexico, which confirmed the annexation of Texas and the acquisition of California and the New Mexico territory. He also settled the long controversial territorial boundary with Canada in the Pacific Northwest. Amid all this expansion, Polk supported the release of the Jamestown for the famine relief effort. The passport is also signed by Secretary of State James Buchanan who served in the U.S. House of Representatives and the U.S. Senate, as well as being Minister Plenipotentiary to Russia, before being appointed Secretary of State. He shared President Polk’s sense of Manifest Destiny and westward expansion. As the son of Irish immigrants, Buchanan was supportive of the Jamestown mission to Ireland. Also signing the passport was Collector of Customs, Marcus Morton, who had a distinguished career serving two terms in the U.S. House of Representatives, a term as Massachusetts Lieutenant Governor then fifteen years on the Massachusetts Supreme Court. He also served terms as Governor of Massachusetts. President Polk appointed him Collector of Customs and he served in that position for the four years of Polk’s Presidency.